Moshe is a former campus activist who has faced violence on campus many times. Combining this knowledge with his Krav Maga skills he has developed a program for the campus activist and for every student who attends university. This skills have been refined with over 120 seminars at campuses across the USA, Canada and Israel. Listening to the real life stories of students he has incorporated their success and failures, trial and tribulations, into this unique program. 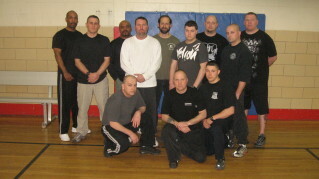 Moshe has taught the elite Jerusalem security guards, American security guards at maximum security prisons, ROTC cadets, FBI, SWAT teams, Sheriffs depts., The Guardian Angels patrol team, members of the Canadian Royal Mounted Police, US soldiers at Fort Dix, and members of the US consulate in Israel. Moshe has not only taught them, he has learned from them. Listening to their true life stories he has internalized their experience to constantly improve the training program. 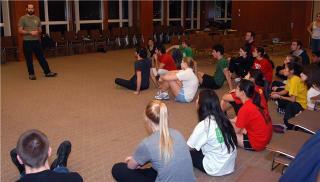 Moshe Katz is recognized by the Israeli ministry of Education as a Krav Maga instructor. For three years he was sent by the Ministry of Education to schools in the Jerusalem/Maaleh Adumim region teaching grades 1 -12. Moshe has designed specific age appropriate programs for each age category and has met with great success in the USA and Israel. When you are on the go you still need to protect yourself. This program is designed to enable passengers on a bus, train, car or plane to protect themselves. Fighting in a car or on a place is very different from fighting in an open space, this program will prepare you. Teachers too can be victims of violence from older students and irate parents. The TSDP is designed to teach basic yet effective self defense moves to teachers with little or no martial arts background or fitness ability. Too many martial arts are built around the dojo or gym. The street is different. This program is designed to only prepare your body but more importantly your mind, for the reality of street self defense. Awareness training, improvised weapons on planes, and the most case scenarios; fighting back against armed terrorists. 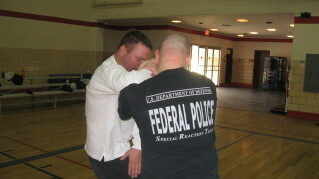 Whether you are taken hostage or someone near one, being held at gun point at with a knife, this program teaches simple and effective moves that everyone can learn quickly. All techniques are drawn from real life encounters. Drawing on his experience with the Israeli Civil Guard, and the Guardian Angels, Moshe teaches simple yet effectively team work for armed or unarmed patrols. Taking effective Krav combat techniques and using them in a vigorous street combat way, this program combines practical self defense with extreme Krav fitness to produce a mean and lean fighting machine. For hand guns and long weapons.